STILLWATER — Oklahoma State’s new defensive coordinator, Jim Knowles, cooked up Jordan Brailford’s big night a long time ago. 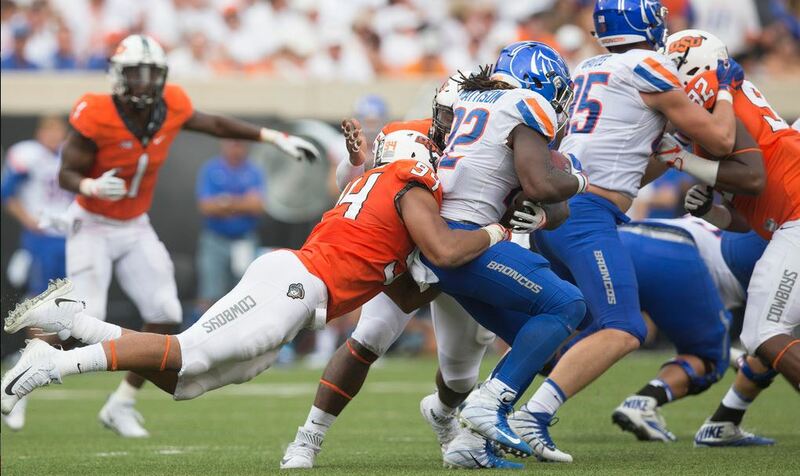 Did Knowles plan that Brailford would have three quarterback sacks, 3 ½ tackles for loss, two forced fumbles and a permanent residence in the Boise State backfield, as he did in the Cowboys’ 44-21 demolition of No. 17-ranked Boise State on Saturday in Boone Pickens Stadium? Well, no. But at some point, between being hired by Mike Gundy from Duke in January and taking apart Boise State, Knowles got creative with Brailford. “Hmm,” Knowles said. “That’s usually about 2 a.m. on some summer night is when that comes up, after about my third cigar. That’s about when those things come up. Knowles threw a lot at Brailford on this muggy afternoon, and Brailford looked like an All-American. On one play, he lined up as a 4-3 defensive end, hand on the ground, and beat the right tackle to the quarterback with his speed. On the next play, he lined up three yards off the ball, as a 3-4 outside linebacker, standing up, and shot into the backfield with an inside move. And on the next play, he lined up as 3-4 inside linebacker, this time standing up and just shaded off the center, and blew up yet another play behind the line of scrimmage. It was that kind of day for Boise State quarterback Brett Rypien and the Bronco offense. Boise State coach Bryan Harsin sounded more agitated by the Broncos’ 1.1 yards per carry average than he did by the seven quarterback sacks. While Knowles may have imagined the Brailford package over late night summer cigars, he installed it last spring. Then Sunday, he told Brailford to get ready, and the Cowboys repped it all week. Brailford was chomping at the bit. So what’s so fun about it, besides the obvious disruption to an unwitting offense? At least once, Brailford’s relocation blew things up and he didn’t even do anything. So why Brailford? What was it that Knowles saw in a 6-foot-3, 250-pound junior who made 57 tackles and 1 ½ quarterback sacks last season? “I think it’s perfect for him,” Knowles said. “I think he’s very versatile. He’s smart. I mean, there were some plays he was in the backfield so fast he missed the tackle in the backfield. He could have had a couple more TFLs. He can think like me. He can think out of the box. I can tell him to go one place one time, another another time, and he picks it up real quick.